Yes, that’s Liam. 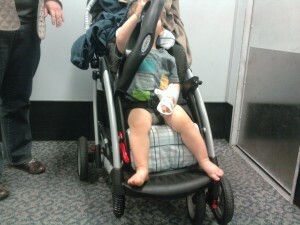 In a three-wheeled stroller. With no pants. We felt so white trash. Unfortunately, this wasn’t the end of the bad fortune. While Shauna was getting that claim filled out, I took Liam for a diaper change to make sure he wouldn’t be uncomfortable on the plane. I figure “hey, 45 minutes before the flight isn’t too bad”, so we don’t worry about changing him once we get on the plane, especially since he’d only had a single bottle in the interim. He fell asleep right away and stayed that way for over two hours. Two hours in which he peed like nobody has peed before. Within a few minutes of him waking up, Shauna picks him up to change him to find that his pants, both front and back, are soaked. His blanket is soaked. There’s a FREAKING PUDDLE on the seat. Even the seat belt could not escape the wrath of Liam’s super soaker. His shirt was even a bit damp, but we could only go so far. We figured, “hey, it’s just overnight, we don’t need extra clothes”, violating my long-standing policy of packing extra as if I were going to be marooned there for a week. we ended up wrapping up his legs in the dry bits of the blanket to get him out of the airport and into the car without anyone wondering why on earth these two terrible parents would be carrying their child around pantless in 40-degree weather. Maybe I picked a good time to stop flying.